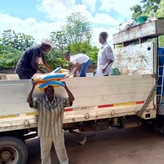 First, thank you to everyone who has reached out to help and donated to the communities after the devastating Cyclone Idai and now the effects of flooding, damaged infrastructure and water-borne diseases. We have received more than $10,000 and donations are now coming by mail and through Canada Helps – which made us a feature charity on its website. We will be setting up a GoFundMe campaign soon to raise funds specifically for families for food, clean water treatment and mosquito nets. We’ve already sent $13,000 in aid. Gabriel wrote to let everyone know help should soon reach the rural areas but the roads are still a challenge. 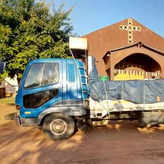 In Murema and Kapasenni, the community started a pick up and delivery team on foot. They carry goods and items on their heads and by bicycles to their areas. “I find this very impressive. Strong women and men [creating] transport not only for their families but the community in general,” Gabriel wrote. 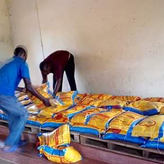 He said that many people are hungry and they are making extra breakfast cereal for the students in Sete Montana school and for other people in need. They are asking teams at the other preschools to make extra food for the community. Gabriel also let us know nursing students in Beira are back in classes. They write a final exam this week and start their practicum next week in Tete Province. They are living in their damaged house for now but it is better than a lot of other places that were demolished. Perpetua also wrote to say she spoke with the nursing students and relayed they are doing OK, and are thankful to be alive. Some good news today! Supplies purchased through your generous donations have arrived at Kuwangisana. 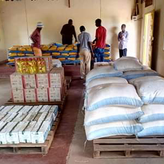 Food supplies of rice, corn, cooking oil, sugar, salt and bar soap arrived by truck and will be stored at Kuwangisana for distribution. This will help for a short while but much more assistance is needed. They are still on need of water treatment, medicine and shelter. Some huts are being rebuilt. Thank you for your help. In Sena ,the classrooms and kitchen had some mud that needed to be cleaned out after the storms. Roof repairs are needed at the school and Kuwangisana buildings. Kuwangisana's office is acting as a emergency operations centre. Emergency planning meetings are happening but they have not received any assistance so far. The needs are great especially for the most vulnerable. Tents for shelter, food, water treatment and medications are urgently needed. Plans are to try to get some supplies from Tete or Quilamane as the main city of Beira is not functioning. Kuwangisana-ADC expresses its deepest condolences to the families of those who have lost their lives over the past week due to catastrophic flooding and severe weather related to Cyclone Idai. 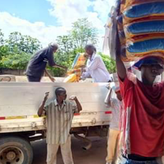 We continue to stand with the People both beneficiaries of our programs and the community in general, we continue to work closely with the Government, our Donors, partner nations and organizations to mitigate the impact of what is still an ongoing natural disaster. Kuwangisana with help from our donors, friends and individuals is mobilizing to provide support for disaster response activities and is committed to providing our communities with the resources required to alleviate the suffering of those impacted by these twin disasters as we receive them. Our thoughts are with those who have lost their homes, their livelihoods, and most of all, their loved ones. We need your support any kind of support is welcome, we stand strong and lets join hands to reconstruct our communities, families and life. Messages from donors have been sent to Kuwangisana and Gabriel posted them on their facebook page. Thank you so much for your help and support! UPDATE from Gabriel: He's going to Caia soon for meetings and to help coordinate bringing supplies back to Sena by train. We sent some funds this week for needed supplies. There is a risk of more flooding if nearby dams are opened. THANK YOU to everyone for the words of support and encouragement and the donations. Your kindness and love are much-appreciated. Visit The Caia Connection facebook page to listen to Perpetua Alfazema's CBC radio interview in Edmonton.